Here's Special Z-Mail #68, a major product announcement from KONI North America & Motorsport Auto, the #1 source for classic Z parts! This special version of Z-Mail is to let you know about a great partnership that started in 2018, when we joined forces with KONI to bring their exciting Sport line of products to the Classic Z market. See below for a basic overview of these great new Sport (Yellow) Strut Cartridges & Shock Absorbers, some initial road test information, and all about KONI, the leader in performance Strut & Shock technology. We'll be following up with technical data, images, and more, soon on the Motorsport Auto website, TheZStore.com. Completely new, created specifically for 70-83 Datsun 240Z, 260Z, 280Z, & 280ZX, and available exclusively at Motorsport, these externally-rebound-adjustable, twin-tube low pressure gas-charged design KONI Sport Yellow Strut Inserts & Shocks are designed for use on both stock & modified street cars as well as autocross & track day cars. Designed to give a good balance of street ride quality and handling at the soft end of the adjustment range, the KONI Sports can easily be tuned up to nearly double the rebound damping force for more aggressive control needs, by simply opening the hood or rear hatch and turning the included KONI adjuster knob. These Struts were one of the most requested upgrades for Classic Z-Cars that we've ever had. Not only can you tailor the Struts to your local driving conditions and to your taste, you can also quickly and easily change the settings and have a blast at a weekend autocross or mountain run, then easily re-set them for a relaxed ride home. Whatever suspension behavior you need is literally at your fingertips. If you race at different tracks and on differing conditions, the adjustable damping gives you an edge in setting up your car for a specific track or autocross course. 2018 SCCA MARRS ITS Champion Jeff Lucas (proudly sponsored by Motorsport Auto) uses a custom KONI Racing Strut setup, with the same adjustable technology as found in the KONI Sport Yellow Struts now available for your Classic Z! KONI was founded in 1857 in Oud-Beijerland, the Netherlands, by A. de Koning, thus the name of the company. Only after WW2 (for you millennials this means the Second World War) Koni started producing telescopic shock absorbers since originally they made leather equipment for horses. Go figure. For us racing fans, the white triangle with the outline of a shock absorber and the black rectangle with the name was synonymous of racing shock absorbers. Even in the days before commercial sponsorships, racecars would display the white triangle. 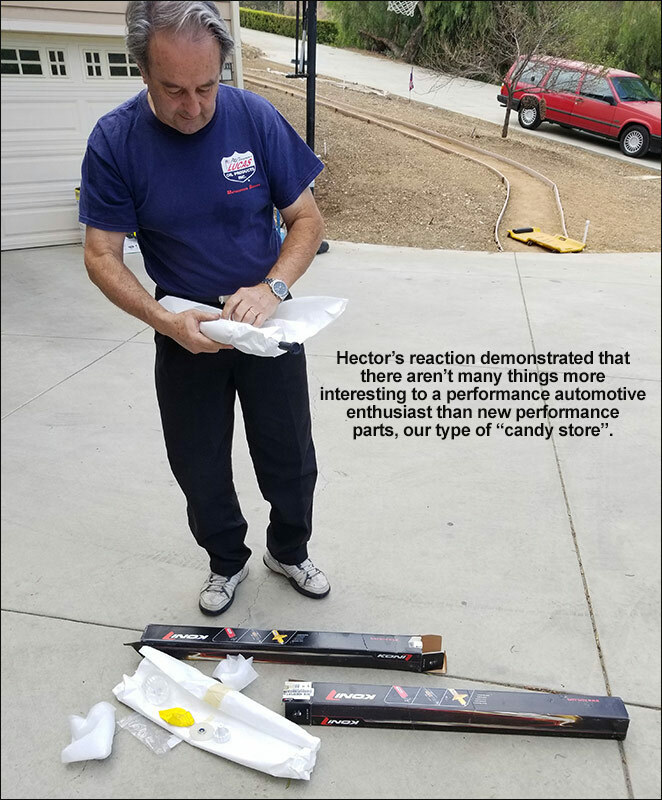 Motorsport Auto's Founder Greg Smith contacted me to help one of KONI's representatives to conduct a road test of their new shocks for classic Datsuns. At first, I thought we'd do it with my Datsun 240Z racecar, but later I found out that Gordon Benson, the engineer who came from their HQs in Kentucky to do the test, wanted a road car. Since my street 240Z was undergoing some engine work, I called my good friend and Group Z member Ian Stewart who offered one of his cars for the task. Motorsport Auto supplied four production prototypes which we installed at Ian's, which for those of you who have never been in his garage, it looks as if a classic Datsun nuclear device detonated inside. The car was ready for Gordon. I'm writing these lines right before leaving to the airport to go to Daytona for the Rolex 24 Hr. race. So stand by, don't go anywhere, because the story continues. I'll tell you about our little test, about the new KONIs and, if there's room, I'll add something about the race. Presale/When Can I Get My Struts? The first shipment, for 70-8/74 240Z & Early 260Z, is expected to arrive in the U.S. this March. We expect to receive the 9/74-78 Late 260Z & 280Z Struts 3-4 weeks later, and then the 79-83 280ZX Struts/Spring Seats 3-4 weeks after that. Want to lock in your set from the first shipment? The Pre-Sale is on now at the KONI page at The Z Store! We recommend placing your order with a credit card, so that your order won't be charged until it ships. If you choose to prepay with PayPal, they will charge you ahead of time. Please contact us with any questions at (714)639-2620, (800)633-6331, or info@motorsportauto.com. What About My 300ZX, 350Z, Or 370Z? We are working with KONI to bring the great line of KONI Sport Yellow shocks for your 84-96 300ZX to The Z Store as well. Stay tuned! KONI is the premier manufacturer of adjustable shocks in the world. KONI shocks are made from the highest quality raw materials and machined to the tightest tolerances. KONI shocks are specifically designed for each vehicle and thus adapted to meet the requirements for each individual application. KONI also has a long and proud racing history, beginning in Formula 1 in the 1950s. "KONI is the shock absorber specialist. For more than a century we have created products that excel in the toughest and the smoothest of conditions. Each KONI shock absorber and ride system is aimed to enrich the user experience; therefore we like to think that our products have a personality of their own." This video gives you a sense of the innovative mindset of the company. This is true not only in the parts they create, but even in how they run their manufacturing operation. While others have drawn back in the industry, they are pushing forward and expanding. This is great news for all Z enthusiasts across all the Z communities! In the early fifties, KONI decided to play a more prominent role in motor sport in order to enlarge the company's reputation. Motorsport was an excellent way to prove the world that the shock absorbers manufactured in Oud-Beijerland were of very high quality. The first event that KONI participated in, was the Tulpenrally in 1955, a Dutch organized rally with international status by that time. The KONI dampers proved to be ideal for rally purposes. What's more, they stood out head and shoulders above their competitors. Until that time, F1 still used the lever arm type shock absorbers. The KONI shock absorbers offered better damping characteristics and the possibility to mount the spring around the damper, which made it more compact. The first official Grand Prix that KONI participated in was in 1958 with Ferrari. The Belgian driver Gendebien made his appearance on the Monza track with KONI and took sixth place. After the start with Ferrari the business went fast and in 1971 KONI achieved its first World Championship win, as Tyrrell Ford won the driver's (Jackie Stewart) and constructor's championship. More About Koni Struts, By Dallara Racing! Koni has proved themselves in the racing community. Dallara Racing gives their perspective on a long productive partnership with KONI. Want even more information? We of course don't have any videos (yet...) of these on an early Z, but our friends at American Muscle go through the Koni's along with Eibach springs (which we highly recommend!) on a newer Mustang, and take a short road test for impressions. Some good points that might help you decide how to use them on your Z. Thanks to you, we are in our 39th year of providing Z-Car enthusiasts the greatest selection of parts and accessories in the world. Your business is very important to us. Our dedicated professionals are always available to answer any questions you may have and help you find the parts you are looking for. Our goal is to always have the "world of Z's" at your fingertips! You can count on Motorsport. Our prices can't be beat, we ship orders promptly, and because we're Z-Car experts, we provide the technical support you need to make your project a success. We are all Z-Car enthusiasts. Many of us have Z's of our own, and the rest of us are looking! Our customers keep coming back because we do things differently. The Z Store showcases some of our most popular items, however space limits us from listing every part we carry. If you don't see a part you want, we want to know about it! We designed The Z Store to be your source for keeping your daily driver, project car, or favorite pastime, just how you want it. We're adding more parts all the time! We currently have over 6000 Z parts online, with many more on the way. We have organized The Z Store first by era. The initial generation of Z's from 1970-1996 is the largest section, including parts for the Nissan & Datsun 240Z, 260Z, 280Z (S30), 280ZX (S130), and 300ZX (Z31 & Z32). There are also sections for the 2003-2009 Nissan 350Z (Z33), and the 2009-current Nissan 370Z (Z34). The goal of The Z Store is having everything you need for your Z at your fingertips. Our sales technicians are knowledgeable Z enthusiasts themselves, and their job is to help you finish your project, whether it's a small carbon fiber upgrade for your 350Z or 370Z, or a challenging complete restoration of your 240Z. Have a suggestion? Comment? Question? Can't find a part you need? Just call us at (800)633-6331, from 8-5 Monday-Friday, or 9-1 Saturday, Pacific Time. We are also more than a supplier of parts and accessories. Almost every year for 22 years running, we've hosted the largest annual Z-Car show in the world, the Z-Bash / Z-Car West Coast Nationals, with hundreds of Z-Cars in attendance, and thousands participating in an exciting 3 day event. Our team sells more parts, because we sell more than just parts! Thanks for your patronage! Z-Mail #69 with a Z Sale, new stuff, and more! Don't miss your chance at the perfect part, be sure to put zmail@motorsportauto.com in your approved email addresses, and address book. From all of us at Motorsport & The Z Store, thanks again for joining Z-Mail!